chemistry experiments for kids | The Loudest Librarian! Although I was nervous last week about my first summer science workshop for 5th and 6th graders at the Burlingame Public Library, I was surprised at how excited I was to do this one. I had set the theme as “Crazy Chemistry,” but had trouble finding projects that were not too time-consuming or involved equipment that would difficult to use in the library. 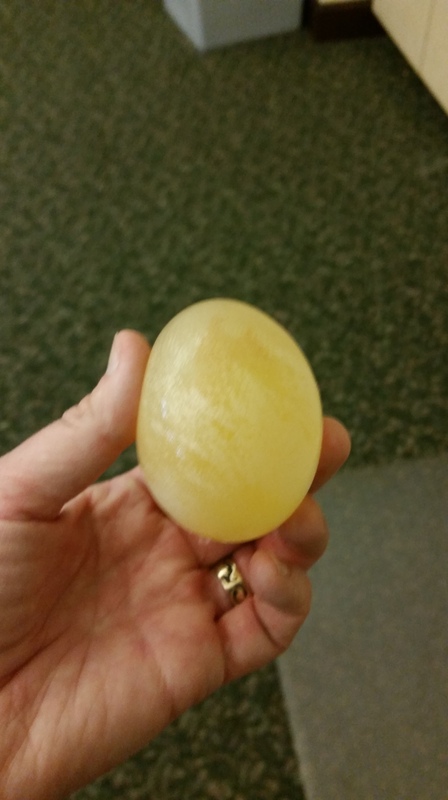 I finally settled on making a naked egg, an acid-base experiment, and a homemade lava lamp. It ended up being a lot of fun, and thankfully did not end in a giant mess on the carpet. I learned about this from my coworker, Carbelle Imperial, who had demonstrated it in her Make It classes at the Pacifica-Sharp Park Library. I added extensions from Steve Spangler Science (Here’s his description: http://www.stevespanglerscience.com/lab/experiments/growing-and-shrinking-egg). This was really more of a show-and-tell than a hands-on project, but it made a great lead-in to the topic of chemistry. I had soaked three eggs in vinegar in my refrigerator three days before. After the first 24 hours, I put one of the eggs in water that I had dyed green, another in corn syrup, and a third in fresh vinegar. Basically, the vinegar, (acetic acid) reacts with the calcium carbonate in the eggshell and slowly dissolves it, leaving only a soft translucent membrane to hold the egg white and yolk. The egg in fresh vinegar also absorbed extra fluid, making it much larger than normal. The egg in the green water was also supposed to swell to a larger size, but mostly it just turned green (I think I should have left it in the vinegar for at least another day before putting it in the water). The egg in corn syrup shrank, and became slightly saggy, since some of the water molecules had passed from the egg into the syrup. To start this week’s workshop, I had the kids sit in a circle on the floor. We talked briefly about chemistry, and how it is the study of matter. I said that I always think of mad scientists mixing chemicals, but that chemistry can be used to identify and learn more about substances, as well as to make new things. Then I pulled out a fresh egg and a bottle of vinegar. 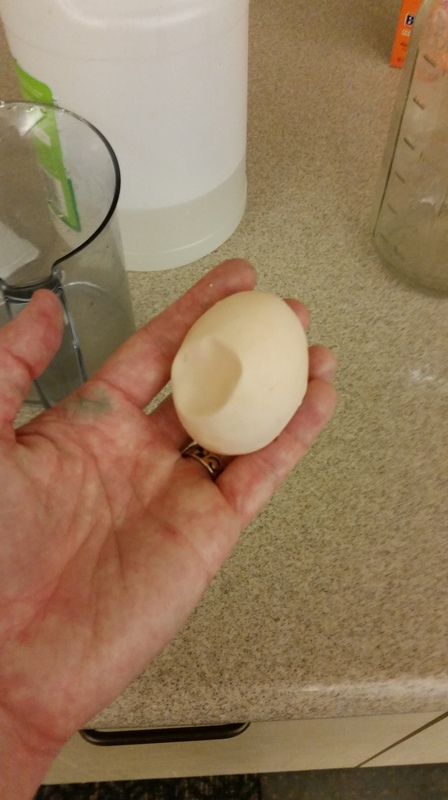 I put the egg in a plastic container, which I filled with vinegar. After a few seconds, tiny bubbles began to form all over the surface of the egg. I explained that vinegar is a mild acid that dissolves the shell around the egg. Then I passed around each of my naked eggs, one at a time, and explained each one. The Naked Egg discussion made a great intro to the next project. Since we had been working with vinegar, a mild acid, I said we were now going to find out how to determine if something was an acid or a base. I asked the kids if they knew of an example of a base, giving them the hint that it was something that reacts with vinegar. One of the kids guessed baking soda, so I pulled some out and gave a very brief demo of baking soda mixed with vinegar in a plastic container. Before the class, I had put a head of red cabbage in my juicer and diluted the juice with water in a large jar. I passed this around for the kids to smell (P-U! ), and also showed them another head of cabbage so they would know what it looked like. I explained that red cabbage leaves contain a substance called anthocyanin, which changes color when it is exposed to an acid or a base. I poured a small amount of my cabbage juice into two Dixie cups, and then put a tiny amount of vinegar in one, and baking soda in the other. The vinegar turned the cabbage juice bright pink, while the baking soda turned it a blue-green color. I then pulled four plastic bottles containing different “mystery” substances, labelled A, B, C, and D, and told the kids that they were going to test each one to determine whether it was an acid or a base. 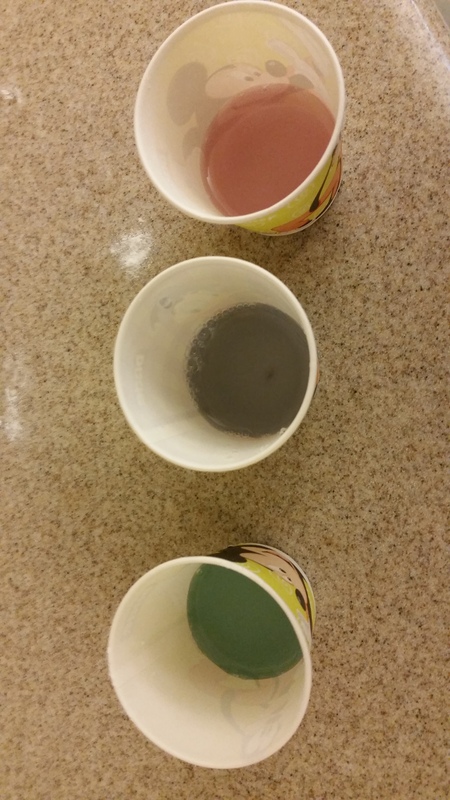 (A was lemonade, B was baking soda mixed with water, C was vinegar, and D was water). I divided the kids into pairs, and gave each of them four Dixie cups. I poured a small amount (about an eighth of the cup) of the cabbage juice into each of their cups, and gave them paper and pencils to take notes on their results. I passed around the different mystery bottles, with a straw to use as a dropper for each one (I showed them how to dip the straw into the liquid, and put a finger over the end to carry a small amount of the liquid over to the testing cups). The kids seemed to have fun doing the experiment. Many of them guessed that A was lemonade (the yellow color was a giveaway). They were confused about the water, which of course didn’t have any effect on the cabbage juice, but a number of them figured that out too. I was impressed by the notes that they took. Several of them made simple charts to track the results, while one team made a number of observations about the look and smell of each liquid. At the end, I asked the kids which of the substances they might want to drink, and asked if anyone would like some Mystery Liquid A. I had a couple of bottles of lemonade set aside, and we took a short break to drink some. I explained that lemonade contained citric acid, and joked that they could tell people they had been drinking acid at the library (ha ha). 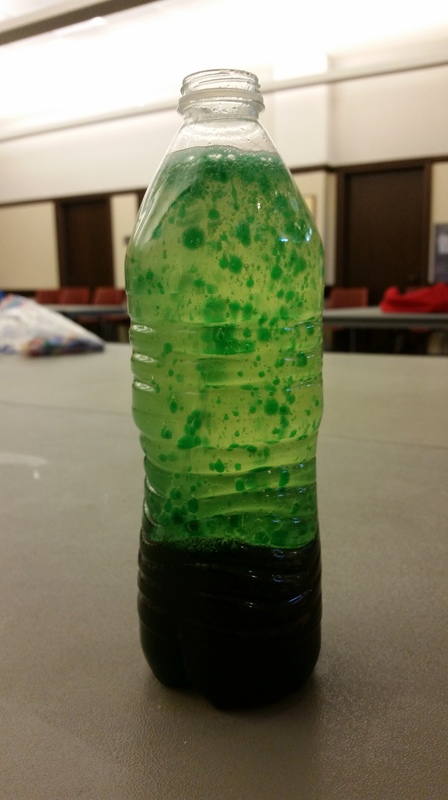 This project appears on a lot of web sites, including Steve Spangler Science: http://www.stevespanglerscience.com/lab/experiments/bubbling-lava-lamp. It’s very simple, but it was a big hit with the kids. I started out by showing them one I had pre-made, a water bottle filled with vegetable oil and water that I dyed green with food coloring. I asked the group why the water and oil were separated. Most of them knew that oil and water didn’t mix, and I elaborated by explaining that the water is denser than the oil and sinks to the bottom, because the molecules are so tightly packed together. (I read recently that there are more molecules in a glass of water than there are known stars in the universe). I went on to talk about how the water combines with the food coloring, but the oil does not. I realized later that I could have gone into more detail about how water molecules are polar, with positive and negative poles like a battery, while the oil is nonpolar, with a shell of negative charges surrounding each molecule, and that polar and nonpolar molecules don’t mix well. Since I was nervous about the carpet in the room I was working in, I added the oil to the bottles myself, filling each one about three-quarters full. The kids then carried the bottles to the sink to fill them up the rest of the way with water. I had them work at one big table for the rest of the project. They each chose the color they wanted to dye the water, and dropped several drops of food coloring in. Now for the big moment: I pulled out an Alka Selzer tablet and broke it up, dropping the pieces into my lava lamp. 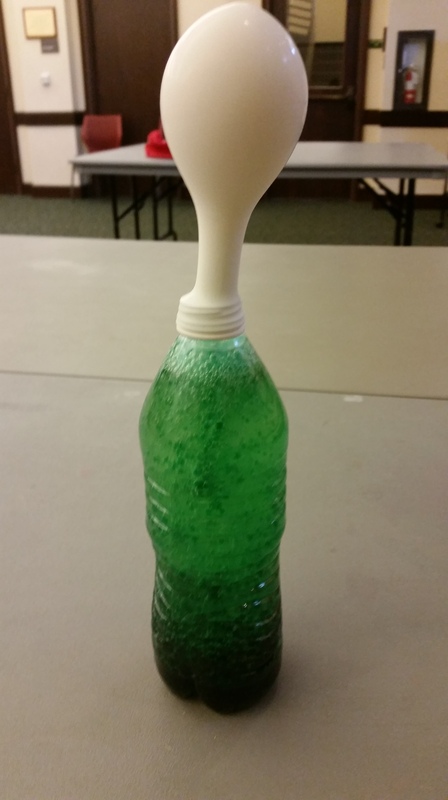 The Alka-Selzer reacted with the water to create bubbles of carbon dioxide, which carried the green water droplets to the top of the bottle, where they would pop, and the water would sink back down. The kids loved that part, and were eager to get their own Alka-Selzer tablets. They spent the rest of the class happily plopping and fizzing. I stretched a balloon over the top of my bottle, and showed them how it would fill up partially with air from the carbon dioxide. They were eager to try that too. Thankfully there were no brightly-colored oil spills! At the end of class, I let them rinse the outside of their bottles off in the sink (they had all gotten a bit oily), and sent them home with their lava lamps and extra Alka Seltzer. All-in-all, I had a great time, and they seemed to too. Next week’s theme is Physics, and I’m planning to make Marshmallow Catapults. I’m expecting a sugary battlefield. Wish me luck!